Use these simple tips and tomato nutrition facts when eating and preparing tomatoes to max out your health benefits. If you grow your own tomatoes, wait as long as you can to pick them. 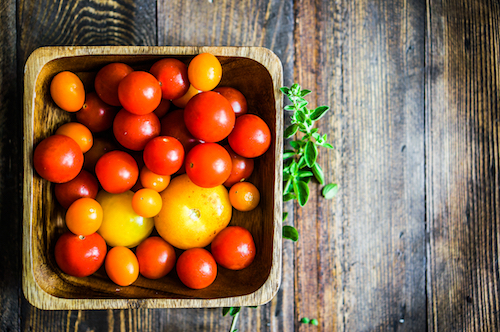 Vine-ripened tomatoes contain nearly twice the vitamin C and beta-carotene as their green-picked counterparts. The antioxidant lycopene is a red pigment found in tomatoes. Tomatoes with the most brilliant shades of red indicate the highest amounts of lycopene and its fellow antioxidant, beta-carotene. Lycopene, the antioxidant found in tomatoes in large quantities, is located in cell walls. 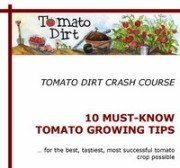 Cooking tomatoes releases lycopene to do its work. A combined analysis of 21 studies published in Cancer Epidemiology Biomarkers and Prevention showed that men who ate the highest amounts of raw tomatoes had an 11% reduction in risk for prostate cancer. Those eating the most cooked tomato products fared even better: their prostate cancer risk was reduced by 19%. Lycopene is fat-soluble. That means you’ll get the maximum benefit of tomato nutrition when tomatoes are absorbed in your body with the help of fats. Cook tomatoes in a touch of olive oil or pair tomatoes with a avocadoes (in small amounts) to help your body absorb lycopene more easily. Since tomatoes have high water content and are low in calories, eating them often can help you feel full while not adding extra calories. Dieters can eat a lot of tomatoes and still limit their caloric intake. Eating tomatoes regularly is also good for your heart – one of the leading benefits of tomato nutrition. In a study of 40,000 women conducted at Brigham and Women's Hospital (Boston, MA), those who consumed 7 to 10 servings each week of tomato-based products were found to have a 29% lower risk of cardiovascular disease compared to women eating less than 1.5 servings of tomato products weekly. Eating even small amounts of tomatoes makes a difference. One study from Cancer Epidemiology Biomarkers and Prevention showed just one 6-ounce serving a day of raw tomato helped reduce the risk of prostate cancer risk by 3%. Spinach contains high amounts of iron. It also contains a high amount of oxalic acid, which prevents iron absorption. But vitamin C can come to the rescue and help. It aids in the absorption of iron. Since tomatoes are an excellent source of vitamin C, you’ll get more benefits of the iron in your spinach when you eat tomatoes (or another food source high in vitamin C) along with the green stuff. Eat 1.4 cups of raw broccoli and 2.5 cups of fresh tomato (or 1 cup of tomato sauce or ½ cup of tomato paste) daily to get best tomato nutrition benefits. (OK, we admit it – that’s a lot of veggies to stomach all at once! You could try it in smaller proportionate amounts.) According to a study in Cancer Research, the tomato-broccoli combination shrank prostate tumors in lab animals by 52%.